PSB Seating System was established in 1996 and today it is one of the leading manufacturer for seating systems, catering for various markets. 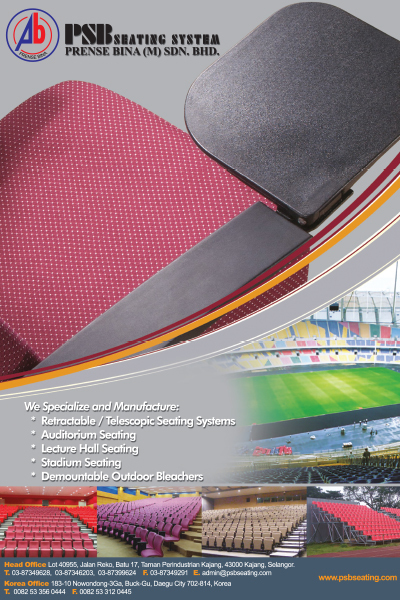 PSB are specialists in Retractable / Telescopic Seating Systems, Auditorium Seatings, Lecture Hall Seatings, Stadium Seatings, and Public Waiting area seats in Malaysia, where particular importance is given to the design, quality, comfort, flexibility and cost effectiveness for clients all over the world. PSB Seating System is managed by a team of professionals who have the expertise in seating systems. As a result, the products that are manufactured are of high quality. PSB Seating System is also committed to Research & Development where there are continuous strives to exceed their clients expectations. PSB is proud to provide quality, comfort and selections that will certainly hold their audience’s complete attention.